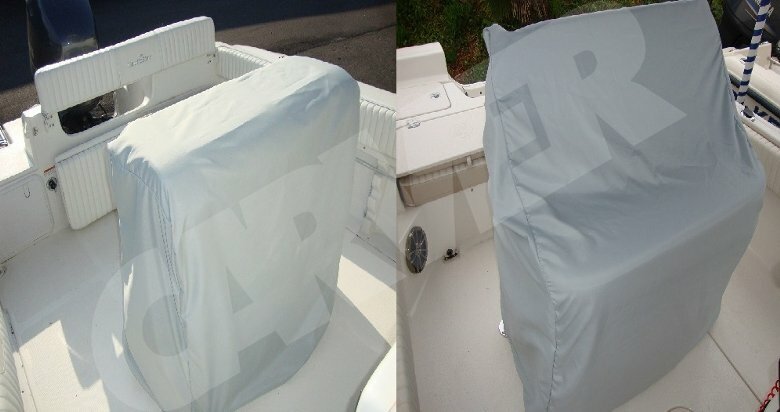 New for Boat Covers Direct! We are proud to offer a leaning post cover by Carver Industries. This cover is made in the USA with the same quality construction Carver employs on all their products. Available in the dimensions 47”H x 41”W x 24”D, our leaning post cover will accommodate rocket launchers for posts shorter than 47”. This cover comes in three materials: Poly-Guard, SunDURA, and Sunbrella®. These are high quality marine grade materials which offer superior water repellency and UV resistance. Sunbrella® is the most desired material in the marine industry, carries a 10 year warranty and available in 24 colors. SunDURA is offered in numerous bright colors, and it is very fade resistant. Poly-Guard covers are warrantied for 5 years. SunDURA covers are warrantied for 7 years. Leaning post covers feature an adjuster strap that allows you to secure the cover at the back of the post. A shock cord is sewn into the hem of the cover to provide a snug fit. These covers will ensure your leaning post stays nice and clean and is protected from the elements. Sun-DURA™ is a 100% marine grade polyester fabric which is made in the USA. This material was specifically developed to provide superior water repellency and UV resistance, and it is a Carver Industries exclusive. Sun-Dura™ is our most popular leaning post cover material, and because it is so water repellent, it makes a great choice for areas which receive a lot of rain. It is also a solution dyed material, which means that its dye is inherent to the cover's fibers, causing it to be exceptionally fade resistant. Sun-DURA™ has a 7 year warranty.